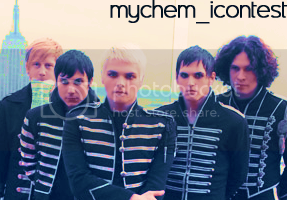 This is an icon challenge community for the band My Chemical Romance. Anyone is welcomed to join and participate, as long as you abide by the rules below. As a part of this community, you must abide by these rules. Additional rules may be posted with challenges. 01. READ ALL OF THE RULES BEFORE JOINING. 03. All icons must be made by you. 04. You may not submit icons that you've made before the challenge date or posted somewhere else before the challenge date. 05. All entries must stay anonymous until winners have been announced. 08. When voting, please vote for your top 3 favorites. If you are interested in becoming an affiliate, please leave a comment here.